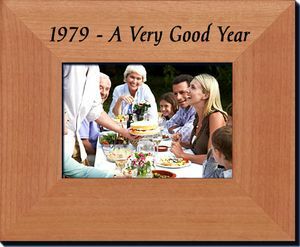 1979- A Very Good Year Frame. Give this to someone who has an upcoming 40th anniversary party or a 40th birthday coming. This picture frame holds a 3.5" x 5" photo and is a thoughtful gift for both friends and family members. The frame is custom made from alderwood and says "1979- A Very Good Year" on it.